Throughout the Middle Ages, the synagogue developed as the central identifying institution and physical building for Jews, replacing the still yearned for but increasingly distant Jerusalem Temple as the focus of Jewish identity. Equally important, the synagogue became the symbol par excellance of the Jews and their community for the Christian (or Muslim) majority populations in the countries where Jews were settled. For Christians, the synagogue was a Jewish church, but much more so, it came to symbolize in opposition all that the church represented. Though relatively little known today, medieval synagogues were not symbolic abstractions to the men and women of the Middle Ages. They were at the very center of their religious, social and political lives. These synagogues, which were once omnipresent across Europe, the Middle East and North Africa are now, however, sparsely preserved, and in most localities their former presence is entirely forgotten. With the exception of a few buildings that still stand, such as the so-called Rashi Synagogue in Worms, Germany; the Altneushul in Prague; and the former Great Synagogue and Samuel Abulafia Ha-Levi Synagogues in Toledo, medieval synagogues receive little attention other than from a few dedicated scholars, except when their long-buried remains are uncovered. Until recently, such discoveries were mostly accidental, but a new generation of researchers is now seeking out these remains to reveal a hidden past. In the past two decades much more evidence has become available to enhance our knowledge and understanding of medieval synagogues. Some of this information is archaeological, and even more derives from the close study of documentary evidence – in Hebrew and local languages – by historians such as Yom-Tov Assis in Spain and Ariel Toaff in Italy, to whose work I am indebted. 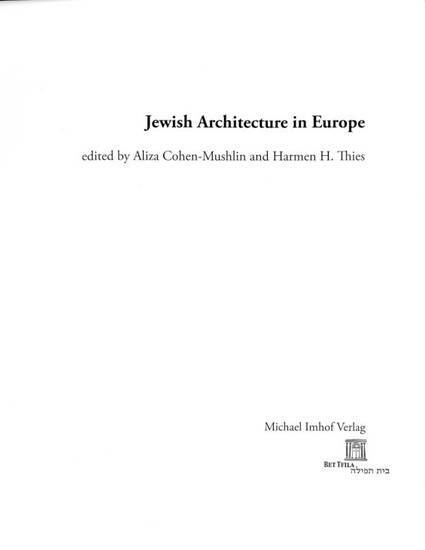 This information, often collected in the course of other research, can be assembled to present a fairly detailed picture of synagogue architecture, decoration and use in some places for some periods of the Middle Ages. We know the general and specific distribution of medieval synagogues, and we have physical evidence for perhaps a few dozen. This paper focuses on evidence from the Mediterranean region, especially from Southern Europe. Until the 15th century, hundreds of Jewish communities populated the Iberian and Italian peninsula, and there were Jewish communities throughout the Balkans. These places had synagogues, and many had more than one. While still little physical evidence of these buildings is known (exceptions are Trani and Sermoneta in Italy and Toledo, Cordoba and Segovia in Spain), we can reconstruct much of their appearance and some aspects of their use and significance. In Spain and Italy there were synagogues of many sizes and plan types. Many were richly decorated. There were community synagogues, private synagogues, and synagogue organized by charitable societies. The locations of synagogue were well known, but the entrances to most synagogues were often protected by exterior courtyards, rather than face directly onto the public street. Synagogue were usually imbedded into the physical as well as the social fabric of their surrounding (Jewish) communities, and prayer halls were often part of larger complexes which includes spaces for other religious and communal functions. While the synagogue was not a distinct architectural type, it was a functional one, and the architectural and liturgical adaptations needed to produce and protect the medieval synagogue were influential in subsequent centuries. Many of our modern notions of what a synagogue looks like, how it functions, and what it signifies are present in the Middle Ages.